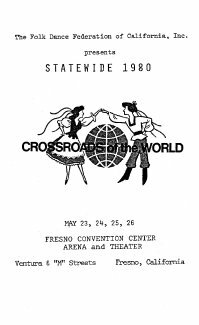 It's been a while but we are coming back to Fresno for the 35th Annual Statewide Festival, May 23, 24, 25, and 26, 1980, for "Crossroads of the World," as we start the new decade. 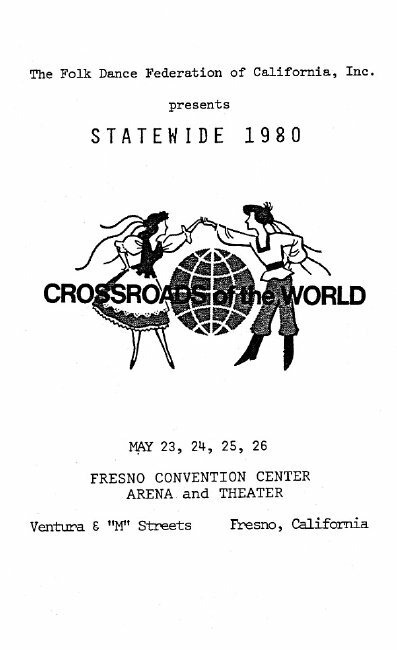 Fresno has a brand new Convention Center. We will miss the old auditorium and Food Market but one doesn't hide a jewel such as the Convention Center. Besides, they say there will still be a Food Fair. Aside from the Warm-Up Party Friday night, held at the headquarters motel, Travelodge, North, along with the After Parties and Installation Dinner, all events will take place at the Convention Center. Something new is in store at the Dancer's Institute, according to Chairman Frank Bacher. There will ba a square and round Dance session, 9:00 a.m. to 12:00 noon Saturday and folk dance instruction from 1:30 p.m. to 4:30 p.m. That will keep 'em busy! And the Food Fair will be open for business during all dancing hours. There will be Festival dancing Saturday night, Sunday night, and Monday afternoon. You have a right to expect a fine Concert under the direction of Miriam Lidster. Unfortunately, I lack statistics but can assure you, the program was well received. The After Parties all take place at the Travelodge and there was a Kolo Hour Saturday night, prior to the Festival. Chairperson Cleda Rodrigues was responsible for the Installation Dinner at the Travelodge, Sunday night, along with Co-chairpersons Jim Kearns and Gladys Kearns, with Jim also handling the MC duties. President Dorothy Daw of the South and Ernie Dresher of the North installed the new officers and Dorothy received her Past President's pin as did retiring president of the North, Bruce Wyckoff. Past President Ernie Dresher, when introducing the Past Presidents, singled me out for a special award for having attended every Statewide. Dave Slater, the South's incoming President, fumbled a little in pinning Dorothy but finally mde it. All in good fun, Fran! Thre was a barbecue Monday with a little dancing thrown in. And we want to thank some of those on the Committee not already mentioned: State Chairperson, Cleda Rodrigues; Registrar, Gladys Kearnsf; Publicity, Vera Jones; Square Dance Callers, Sara Magarin; Decorations, Mary Wyckoff; Dance Programs, Christ Valero and Mille Riba; Sound, Kevin Buneman and Frank Bacher; and the others on the Committee.